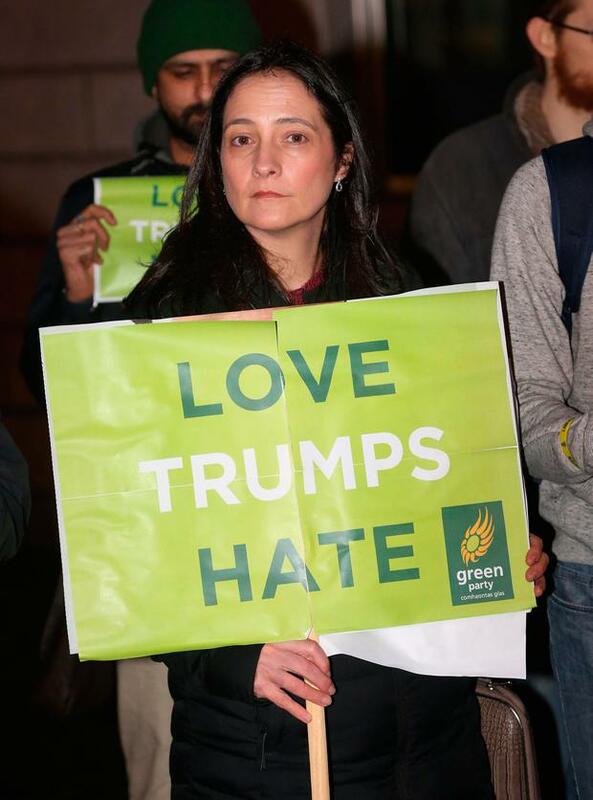 PROTESTERS gathered outside the US Embassy this evening with a message to Taoiseach Enda Kenny - 'don't offer a shamrock to Donald Trump on St Patrick's Day'. 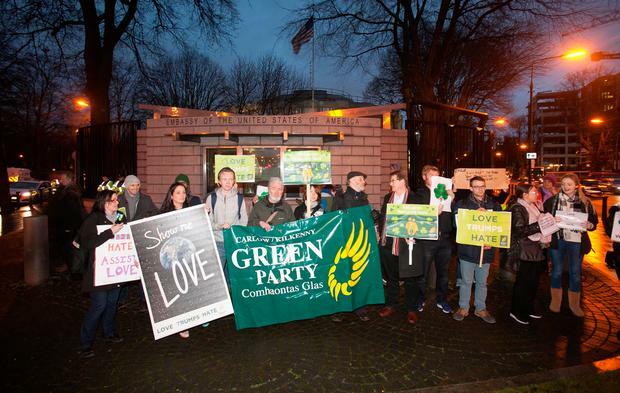 A small group gathered outside the Ballsbridge building for a peaceful protest organised by the Green Party - in response to the US President's travel ban for nationals from seven different countries. The Executive Order prevents citizens from Iran, Iraq, Syria, Somalia, Yemen, Sudan and Libya travelling to the States over the next 90 days. Around 30 people were present outside the embassy this evening, with Green Party leader, Eamonn Ryan calling on Taoiseach Enda Kenny to take a stance when he travels to Washington in March for the St Patrick’s Day visit to the White House. Mr Ryan said the Taoiseach should look at doing something different this year. “I think people in Ireland, while it’s not easy to do, should be standing up for what we believe in,” Mr Ryan said. “It’s up to the Government to represent us and to look at ways they can reflect the public mood here. “We don’t agree with the ban on refugees." Mr Ryan added that he believed the Taoiseach should not hand over a bowl of shamrock to Mr Tump. “Irish-America takes that whole shamrock thing seriously, they have a romantic connection to our country that’s very strong. If we’re handing over that bowl of shamrock, we’re saying that everything is the same and we’re still the best of friends,” he added. Sandra Dunne (49) from Kilmainham said "my sign says ‘not in my name’ and that says it all". “I don’t want him (Enda Kenny) to hand over the shamrock and act like it’s business as normal. “I think he should make a stand, because he has been elected by us and we give him his mandate,” she added.